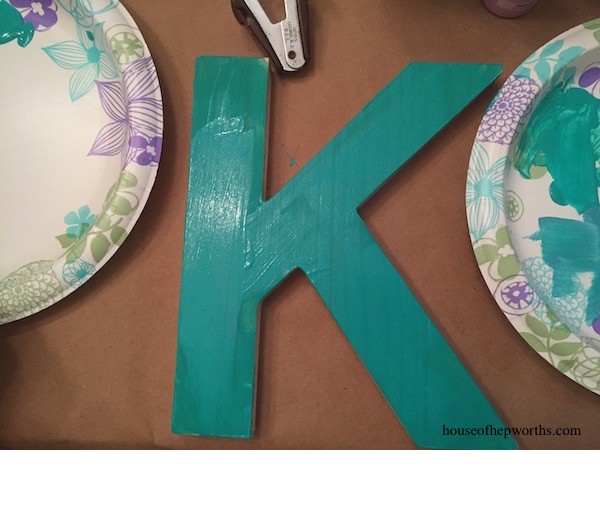 Here’s a really fun craft project for tweens! My daughter wanted to have a sleepover with a bunch of her friends. We planned a few activities to keep them occupied, including movie time and craft time. Craft time for a bunch of tween girls can be tough. We had to come up with a craft for all skill levels. After walking up and down the craft isles at Target, we finally came up with a cute, easy project that everyone could work on together. 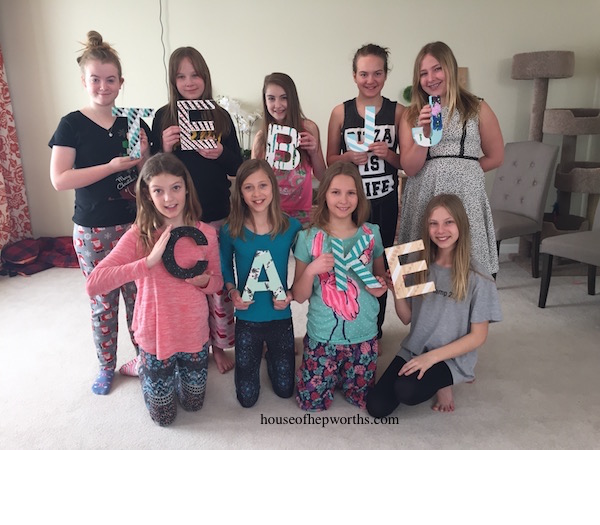 We purchased a wooden letter for each girl (the first letter of their first name). 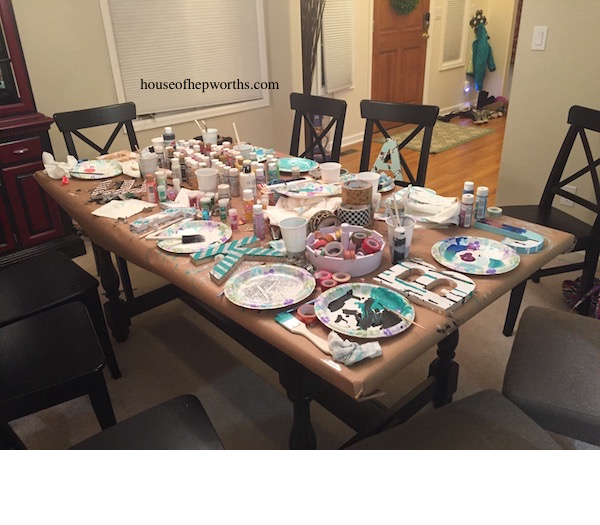 Then we loaded the table with all the craft supplies we could dig up: yarn, glue, glitter, washi tape, craft paint, decorative duct tape, sharpies, sequins, etc! 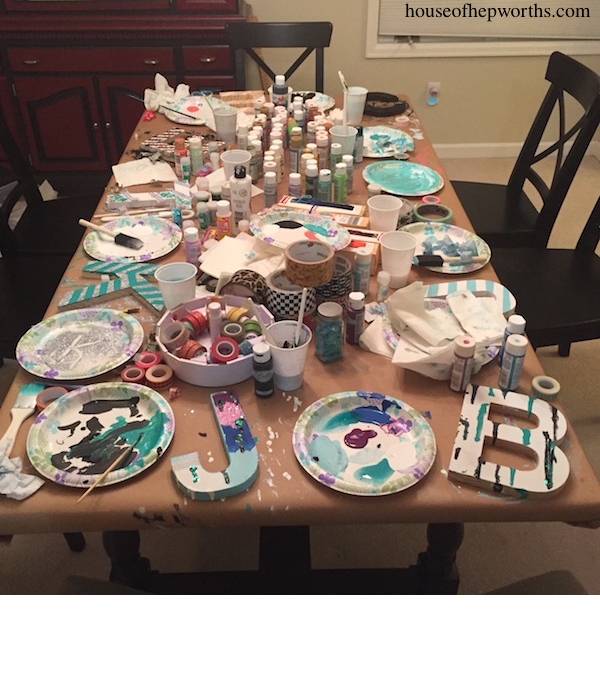 I covered the table in a large piece of brown craft paper, and gave each girl a paper plate, small glass of water, some paper towels, and paint brushes. 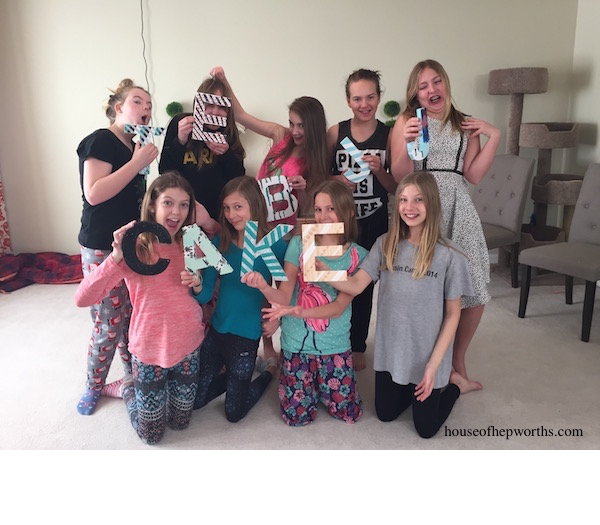 Each girl had a blast decorating their letter to their specific personality. Some girls painted them and went crazy with the glitter. Some girls are not as into crafting and they enjoyed wrapping their letters in Washi Tape. They had such a fun time! 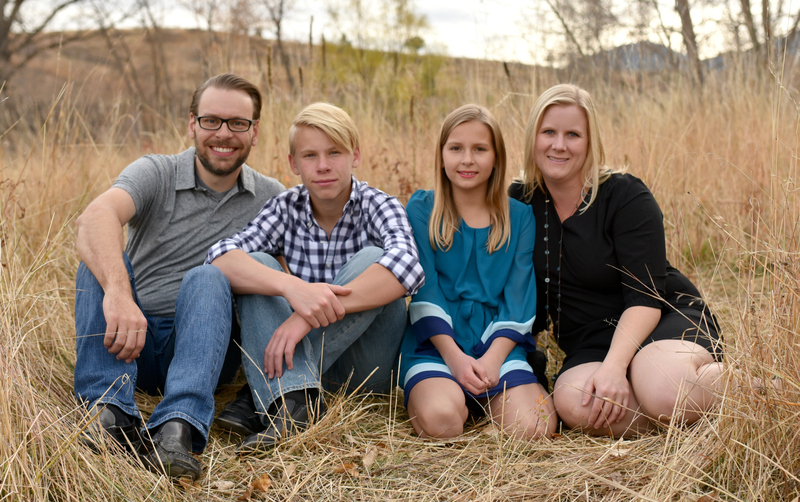 It is so fun to see each of their personalities come through onto their custom artwork. After they were finished and their art was dry, we of course had to do a photo op! They quickly figured out they could spell the word “cake” so of course they had to arrange themselves in that order. The best part about this craft? It is custom and unique to each girl, so they all got to take their craft home and proudly display it in their room! 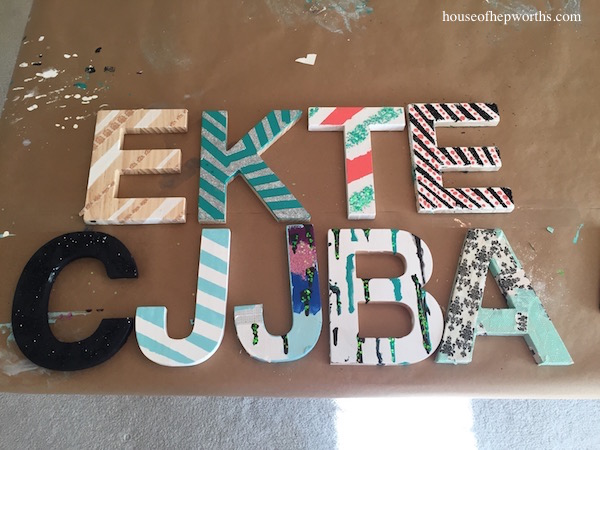 What tween wouldn’t want their own custom crafty monogram? This is just one example of an easy craft project that an entire group can complete together. 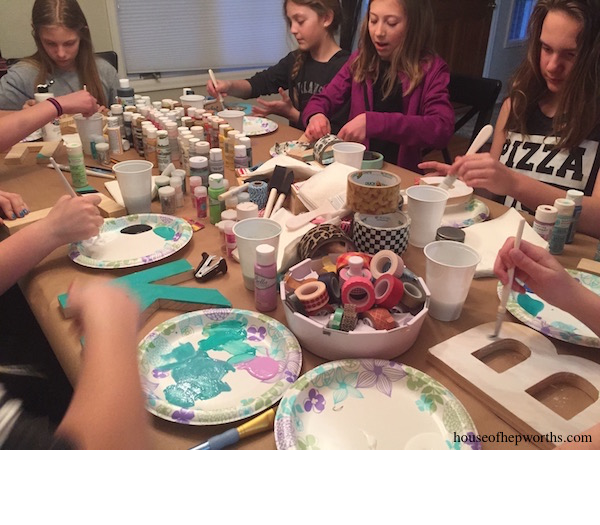 In addition to having a great time crafting, they also had a great time chatting, giggling, and creating strong friendships. « Stunning fireplace makeover with paint!